According to the latest information released by the National Weather Service and National Hurricane Center, Hurricane Florence is not expected to have any significant impacts on Chatham County. Chatham Emergency Management Agency (CEMA) staff are continuing to monitor the storm. 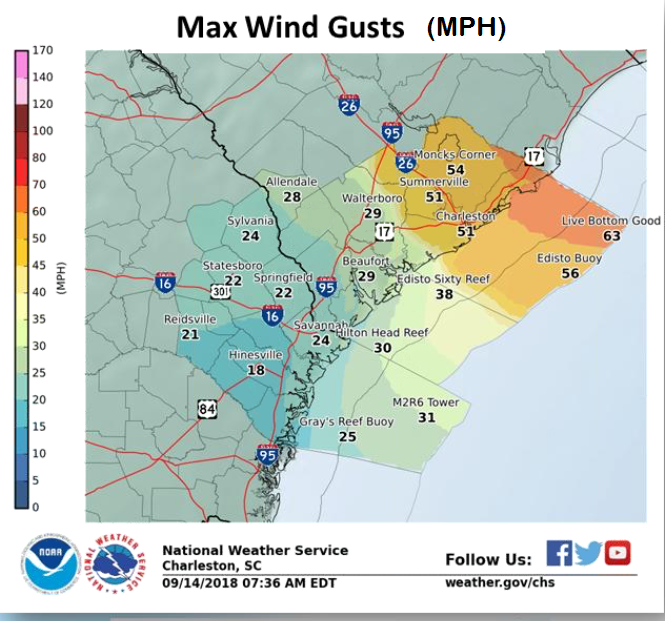 According to the info they released, Chatham County can expect sustained winds between 15-18 MPH with the possibility of maximum gusts up to 30 MPH. Residents should secure any loose, lightweight items which may become airborne. Isolated power outages are also possible. Residents can prepare by ensuring they have non-perishable food items, including water, and by charging cell phones and any additional back-up batteries. The Tropical Storm Warning has been discontinued north of Duck,North Carolina, including the Chesapeake Bay south of New Point Comfort. The Hurricane Warning has been changed to a Tropical Storm Warningfrom Duck, North Carolina, south to Bogue Inlet, including thermonuclear Sound. For storm information specific to your area, including possible inland watches and warnings, please monitor products issued by yourlocal National Weather Service forecast office. DISCUSSION AND OUTLOOK----------------------At 1100 AM EDT (1500 UTC), the center of Hurricane Florence was located near latitude 34.0 North, longitude 78.0 West. Florence is moving toward the west-southwest near 3 mph (6 km/h). A slow westward to west-southwestward motion is expected today through Saturday. On the forecast track, the center of Florence will move further inland across extreme southeastern North Carolina andextreme eastern South Carolina today and Saturday. Florence willthen move generally northward across the western Carolinas and the central Appalachian Mountains early next week. Maximum sustained winds are near 80 mph (130 km/h) with higher gusts. Gradual weakening is forecast later today and tonight.Significant weakening is expected over the weekend and into early next week while Florence moves farther inland. Hurricane-force winds extend outward up to 70 miles (110 km) from the center and tropical-storm-force winds extend outward up to 195miles (315 km). A wind gust to 75 mph (120 km/h) was recently reported at the National Ocean Service station in Wrightsville Beach, and a 72 mph (116 km/h) was recently reported at aWeatherflow site just north of Cape Fear at Federal Point. The estimated minimum central pressure based on surface observation sis 958 mb (28.29 inches). The deepest water will occur along the immediate coast in areas ofonshore winds, where the surge will be accompanied by large and destructive waves. Surge-related flooding can vary greatly overshot distances. For information specific to your area, please see products issued by your local National Weather Service forecast office. Remainder of South Carolina and North Carolina into southwest Virginia...5 to 10 inches, isolated 15 inches. This rainfall willproduce life-threatening flash flooding. Rainfall totals exceeding 14 inches thus far have been reported atseveral locations across southeastern North Carolina. SURF: Swells generated by Florence are affecting Bermuda, portions of the U.S. East Coast, and the northwestern and central Bahamas.These swells are likely to cause life-threatening surf and ripcurrent conditions. Please consult products from your local weather office.